AIM: This article proposes a relative dynamic two-stage network data envelopment analysis model for measurement of bank efficiency based on the slack-based measure.. SETTING: Twenty-seven banks in Ghana during the period of 2009-2014. METHODS: By considering simultaneous processes within the framework of two-stage data envelopment analysis, the slack-based measure approach identifies the sources of inefficiency in the banks.. RESULTS: In the empirical analysis, non-performing loans are an undesirable output in one production process, which should also be treated as a carry-over factor; that is to say, some non-performing loans from the preceding year can be collected in the current year. The carry-over factors should be used to indicate the presence of performance gaps that exist in the banks. The proposed model was used to measure the efficiency of the 27 banks in Ghana during the period of 2009-2014. We also present useful suggestions for improvement in bank efficiency based on the empirical results. CONCLUSION: The 27 main commercial banks in Ghana are far from efficient. For all banks, the efficiency score in the second stage is much higher than that of the first stage. That means more attention should be paid to the first stage of production in order to increase the banks' efficiency. Data envelopment analysis (DEA), as proposed by Charnes, Cooper and Rhodes (1978), has widely been applied for analysis of banking efficiency in Ghana (Alhassan & Ohene-Asare 2016; Alhassan, Tetteh & Brobbey 2016; Saka, Aboagye & Gemegah 2012). The technique can easily accommodate multiple input-multiple output frameworks (Paradi, Rouatt & Zhu 2011; Paradi & Zhu 2013) and is superior to partial analysis (e.g. ratio analysis), which lacks both comprehensibility and theoretical background. There is a plethora of literature available on banking efficiency. The first group of studies applies or extends traditional DEA models to evaluate the efficiency of banks, such as multidimensional efficiency of banks (Asmild & Matthews 2012), technical and economies of scale (Paradi & Zhu 2013), cost and profitability efficiency of banks in China (Ariff & Luc 2008), as well as the impact of the environment on bank efficiency (Yao, Han & Feng 2008a). In these studies, banks are treated as a 'black box', without explicitly modelling the impacts of either intermediate or carry-over factors. Another group of studies attempted to describe the banking processes in a more detailed manner and defined different stages of operation. Seiford and Zhu (1999) proposed the two-stage DEA model and applied it in their evaluation of commercial bank efficiency, with profitability marketability stages taken into consideration. Cook and Hababou (2001) estimated the impact of sales performance on bank branches' efficiency, using the multicomponent DEA approach. 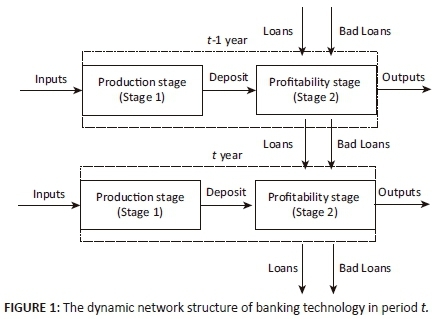 The effect of the performance of information technology on retail banking activities was analysed by means of a two-stage DEA model by Meepadung, Tang and Khang (2009). A novel slack-based measure (SBM) two-stage model for measuring serial production performance of banks was proposed by Fukuyama and Weber (2010). Wang et al. (2014) introduced an additive two-stage DEA model to explore the efficiency of commercial banks in China. The latter approach assumed two serial stages in the banking activities. The aforementioned studies analyse the efficiency of banks by only considering internal complex structures (i.e., multiple components and two serial stages) or dynamic efficiency by treating the banks as 'black box'. None of them calculate bank efficiency by considering the positive influence of non-performing loans (NPLs), by using the carried-over factors in the dynamic two-stage DEA structure. Hence, the present literature on banks' efficiency naturally ignores consecutive time periods of the carry-over factors in the two-stage process, and this novel approach is used in evaluating banks in Ghana for the first time. Alhassan, Kyereboah-Coleman and Andoh (2014) believe the NPLs account for a very high proportion of Ghanaian banking industry assets and should be a significant determinant of banks' asset quality. Therefore, a more appropriate approach is required to deal with the efficiency evaluation of banks in Ghana with two internal stages during multiple time periods. This current study, therefore, considers the internal processes of banks in the measurement of their relative efficiencies. The multiple-period dynamic concept is used in the computation of efficiency, where the carry-over factor of NPLs and loans of the previous years are used in addition to the current year variable to get the efficiency score for each bank. In the practice of the Ghanaian banking system, NPLs are generated in the profitability stage when the loan issued by the bank cannot be paid back during the given time period. Banking activities are affected by this problem in two ways: first, by the loss of the income - banks with higher volumes of NPLs are eventually treated as being less efficient by using NPLs as an undesirable output at the profitability stage (Färe & Grosskopf 2004); and second, as pointed out by Akther et al. (2013) and Fukuyama and Weber (2010), NPLs can be treated as a carry-over factor - NPLs resulting in a certain period can be carried over to the succeeding period, and the model is thus entered as a desirable input. The rest of the article is organised as follows: the literature review presents useful literature on applications of the two-stage network DEA to the banking sector; and the novel SBM DEA model for analysis of the banking efficiency is introduced in the 'Methods' section. The application of the proposed model to analyse the performance of commercial banks in Ghana is then discussed, followed by conclusions and recommendations. Techniques employed in the analysis of bank performance include stochastic frontier analysis, financial ratio analysis and DEA, among others. DEA is regarded as an appealing method for evaluation of bank efficiency in that it can model multiple-output-multiple-input technology without assumptions regarding the functional form of representation of the underlying technology. Cook and Seiford (2009), Sherman and Gold (1985), Ruggiero (2007) and Avkiran and Zhu (2016) showed that stochastic frontier analysis method did not generate superior results if contrasted with DEA. Applications of DEA for analysis of bank efficiency cover the following strands: total factor productivity change (Sanyal & Shankar 2011), economies of scale and scope (Berger & Humphrey 1991; McAllister & McManus 1993), performance of bank branches (Camanho & Dyson 1999; Yeh 1996) and analysis of the impact of reforms (Assaf, Matousek & Tsionas 2013; Fujii, Managi & Matousek 2014; Hsiao et al. 2010; Tsang et al. 2014; Wang et al. 2014). There are other studies that have focused on evaluating the efficiency of Ghanaian banks. First, Alhassan et al. (2014) examined the bank-level factors to explain the performance of the Ghanaian bank loan portfolio, based on the research of Aboagye et al. (2008). Next, the Malmquist productivity index (Alhassan & Biekpe 2015) and stochastic frontier analysis (Aboagye 2012), together with DEA (Saka et al. 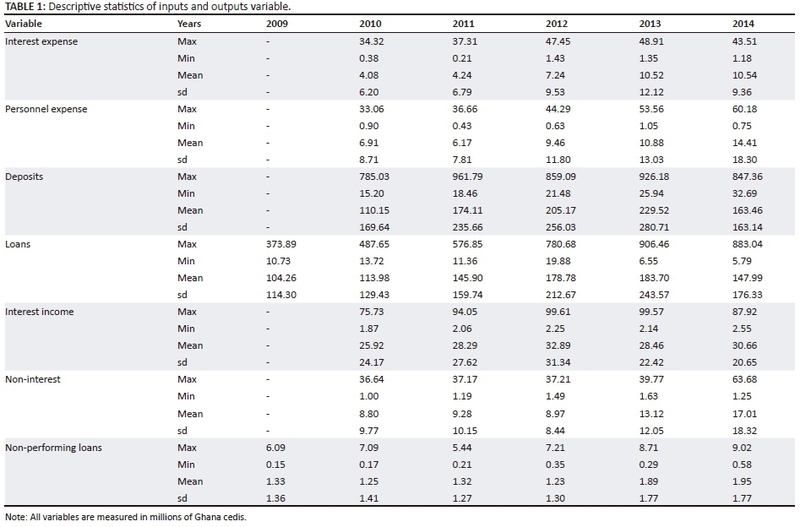 2012), were utilised to measure the efficiency of Ghanaian banks. Additionally, Alhassan et al. (2016) combined DEA approach with the Herfindahl Index and concentration ratio to evaluate the relationship between efficiency and profitability of 26 Ghanaian banks from 2003 to 2011. Alhassan and Ohene-Asare (2016) employed the two-stage DEA models to measure the technical and cost efficiencies of 26 Ghanaian banks from 2004 to 2011, and provided the paths for inefficient banks to 'catch-up' with efficient banks. Alhassan and Tetteh (2017) constructed a two-stage DEA bootstrapping approach to examine the effect of the inclusion of non-interest income on the efficiency and economics of scale of Ghanaian banks. In order to account for the internal processes of banking, we adopt the two-stage network DEA methodology in this article. To properly estimate banks' efficiency, the radial and non-radial efficiency measures are the two measures mostly adopted in recent studies. As stated by Tone and Tsutsui (2014), the non-radial SBM technique can deal with the phenomenon of both 'the input excess' and 'output shortfall'. It can also help in assigning each decision-making unit to a 'furthest' point on the frontier, in that the optimal function can be minimised by evaluating the maximum slacks. In this regard, SBM is an efficient tool for determining the sources of the inefficient banks within the structure of network DEA. We therefore applied the same concept in constructing our two-stage SBM model to estimate the performance of commercial banks in Ghana empirically. In models (4) and (5) above, all the variables on the right side measure the optimal values of overall efficiency. The overall efficiency can be obtained by model (3). 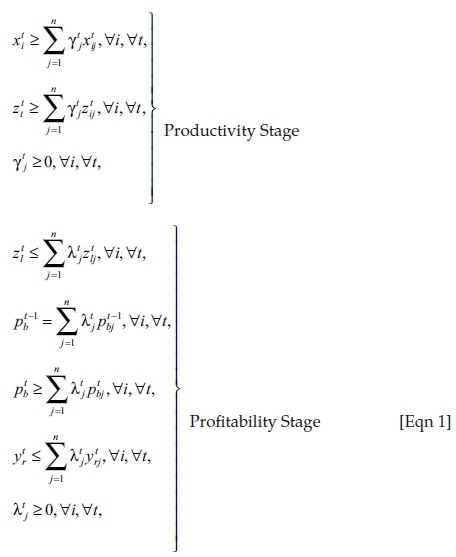 The productivity stage denoted by and profitability stage represented by can be obtained by models (4) and (5), respectively. In model (4), has an interval ranging from (0, 1). When (meaning all slacks are 0), the estimated bank is overall efficient; the opposite implies the bank is inefficient. Likewise, when , and the evaluated bank can be considered as efficient in the overall, for both Stages 1 and 2. In recent times, the Ghanaian banking system has undergone significant transformations. More specifically, a lot of foreign banks emerged in Ghana. This study covers a total of 27 main commercial banks in Ghana during the period of 2009-2014, all of which are rather similar in terms of the services they provide. The dataset is based on the data from the Bank of Ghana, the unique annual financial reports of the individual banks and the annual Ghana Banking Survey. Additionally, loans and NPLs are used as carry-over factors in two time series production periods. In this article, we argue that some of the NPLs produced in the profitable stage of the previous year can be collectible in the current year to increase the bank's assets. The selections of these inputs or outputs are based on the profit orientation approach, with the cost elements (interest and personnel expenses) as inputs and the revenue elements, such as interest and non-interest income, as output. This selection has been used extensively in bank efficiency studies in the literature (see Ataullah & Le 2006; Drake, Hall & Simper 2006; Pasiouras 2008; Zha et al. 2016). Deposit is always adopted as a linkage factor between the two stages in banking efficiency studies (Fukuyama & Weber 2013) (Table 1). The results for the overall efficiency and its corresponding decompositions are presented in Tables 2-4: the mean efficiency scores of each of the overall efficiencies E0 and the sub-stage efficiency scores. The key message here is that the average efficiency remained rather stable for the whole research period. As these scores are relative to the contemporaneous frontiers, one can conclude that banks remained similarly heterogeneous in terms of their performance (efficiency). The average efficiency for the profitability stage showed an increasing trend and exceeded that for the deposit generation stage . This finding suggests that there is a significant gap between productivity and profitability stages in the Ghanaian banking system. Using the bank-specific results, we identified banks that are either highly or fully efficient in Stage 2. This can help to identify and spread best practices within the Ghanaian banking sector. The decline in bank efficiency in Stage 1 can mainly be attributed to dynamics in interest rates in Ghana, which is one of the most important determinants of efficiency. 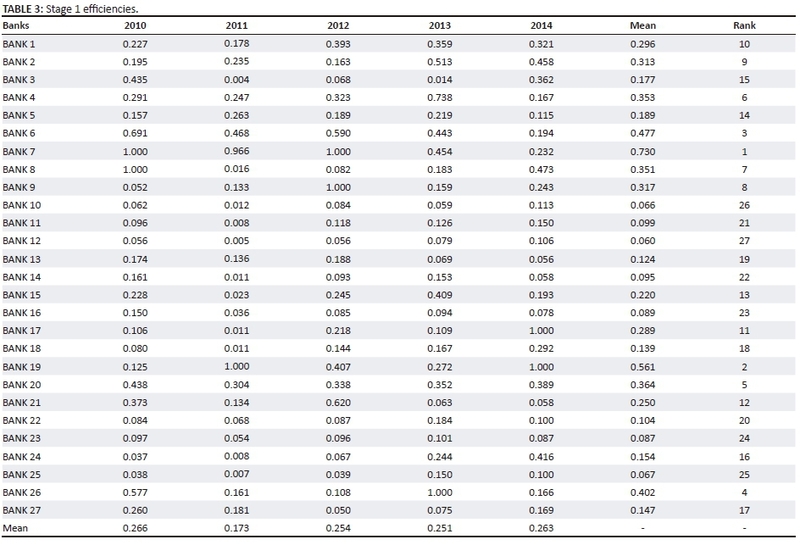 In Table 2, we can observe that for the financial year 2009-2010, only two banks (BANK 7 and BANK 8) were estimated to be efficient, and the rest of the banks were rated inefficient. However, during the same year under investigation, the following banks performed slightly better: BANK 1 (0.614); BANK 3 (0.623); BANK 6 (0.846); BANK 20 (0.625); and BANK 26 (0.755). Only a single bank (BANK 19) was computed to be efficient during the financial year 2010-2011, performance of BANK 7 (0.983) was relatively encouraging, and many banks were essentially computed as inefficient. The mean efficiency of all the banks year by year showed a fluctuation phenomenon during the entire study period: in 2010, the average yearly efficiency for the banks was 0.480, followed by 0.398 for 2011, 0.484 for 2012, 0.470 for 2013, and 0.487 for 2014. 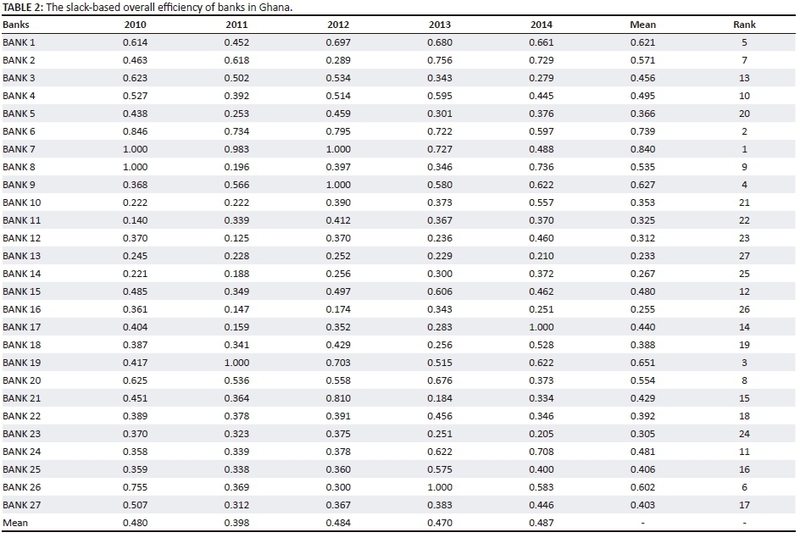 The average efficiency of the Ghanaian banking industry during 2010-2014 does not show an observable change of trend like that in Alhassan et al. 's study (2016). We calculate the overall efficiency together with the efficiency of each sub-stage for 27 commercial banks in Ghana by using our newly-presented two-stage dynamic DEA model. Table 4 shows that mean efficiency of this stage realised more satisfactory results for banks operating in Ghana. In 2010, the efficiency score was 0.873, but decreased to 0.773 in 2011. However, this increased to 0.860 in 2012, dropped to 0.788 in 2013, and then increased marginally to 0.822 in 2014. We can observe most banks' overall improvement in the efficiency scores. In 2010, only six banks were inefficient in this stage, but the rest were efficient. 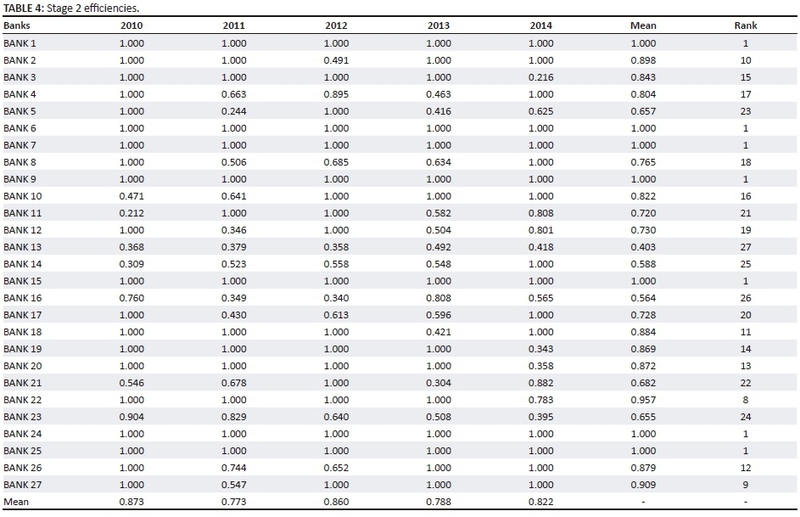 In 2011, 13 banks (more than double the previous year) were inefficient. Nine banks were inefficient in 2012, and 11 in both 2013 and 2014. In general, this stage's efficiency values are much higher than the Stage 1 efficiency values. We computed the yearly averages of all the banks under study, as well as the individual banks' means for the whole study period. 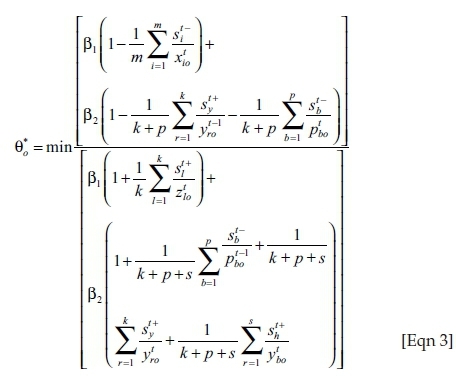 Figure 2 gives an illustration of the efficiency difference of the models used in this study. 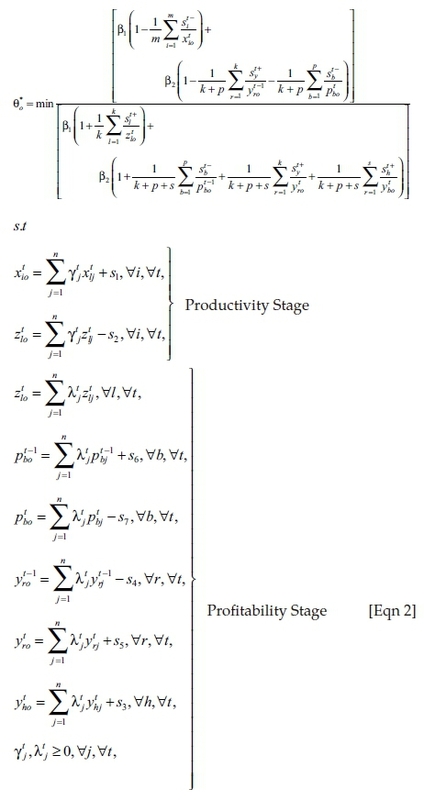 From Figure 2, we can see that most banks had a lower efficiency value in the productivity stage (Stage 1) than in the profitability stage (Stage 2). This has greatly affected the overall efficiency values of each bank. In order for us to investigate the relationship between the overall value and that of Stages 1 and 2, we paid attention to the ranks of the mean efficiency values for each bank. It can be said that most banks have similar ranks in the three types of efficiency discussed above. The two-paired-sample non-parametric Wilcoxon signed-rank test was performed to ascertain whether the differences in efficiency gaps between Stage 1 and Stage 2 are significant (Table 5) The results (z = −2.02, p = 0.043) confirmed that the commercial banks in Ghana have more potential in the generation of profits. The correlation coefficients for the overall and the two-stage efficiency are 0.7112 and 0.9072, respectively. This implies that the overall performance of these banks largely depends on the systematic performance of the two stages. 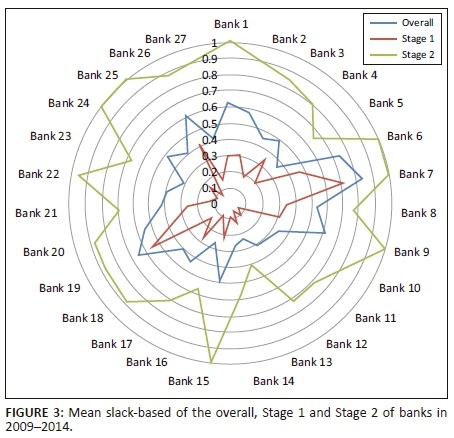 In detail, the mean efficiencies of the overall and the two stages for each bank are shown in Figure 3, and this can greatly help in measuring the real causes of banks' inefficiency in Ghana. 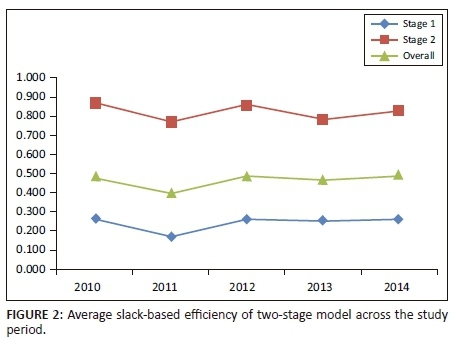 In Figure 3, the mean efficiency for Stage 1 is much lower than the overall, and the Stage 2 values are comparatively higher. We can therefore conclude that the inefficiency of banks currently operating in Ghana is mainly caused by the performance of the production stage (Stage 1) efficiencies. Our proposed model has very important implications for bank managers, in that it can help managers to be able to determine the sources of inefficiencies within the banking industry in Ghana. In addition, managers can improve the overall performance of the industry by targeting improvement strategies towards the two sub-processes; in this case, Stage 1 is of particular interest. In this article, we have developed a novel two-stage DEA model for the effective measurement of bank efficiency on the basis of dynamic SBM network DEA, by modelling the bank efficiency in Ghana, taking into account both desirable and undesirable outputs. Different from the existing DEA approaches, this proposed approach allows for the evaluation of bank efficiency in a time period of multiple years in which the NPLs produced in previous years can be collectible in the current year (t), resulting in additional revenue for the banks. By using this newly-presented model, we find that the 27 main commercial banks in Ghana are far from efficient. Further, we compute the efficiency of two production stages, in order to provide more information for the inefficient banks to improve their performance. We find that, for all the banks, the efficiency score in the second stage is much higher than that of the first stage. That means more attention should be paid to the first stage of production in order to increase the banks' efficiency.